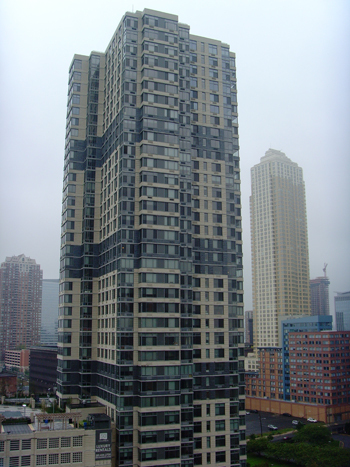 50 Columbus is the fraternal twin to New York City residential tower, the "Zebra Building" on the West Side. The two towers share a pedigree, architect Costas Kondylis. 50 Columbus differs from the zebra building in that the alternating black and white brick on the New York building are of varying widths. The luxury rental tower is the first phase of a three tower project. Attached to the west side of the parking will eventually be a pair of 48 story towers as well. For a complete set of construction photos, check out the classic photoblog.